Ransom Riggs may have written the book on which this movie is based, but Director Tim Burton writes the book when it comes to imagination. In this, his 39th feature film, Burton manages to combine elements from a few of those other films he is known for. The movie goers need not look for them as they should be obvious. Does this work? Absolutely! The main protagonist is Jake, a 16-year-old whom through a series of circumstances uncovers clues to a mystery that takes him away from an ordinary life and propels him to alternate realities and times. 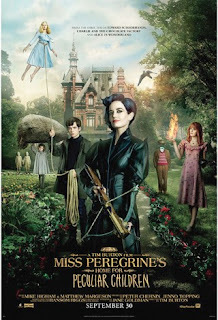 It is here the discovery and purpose of Miss Peregrines Home for Peculiar Children comes to light. Ara Butterfield (Enders Game and a Brilliant Mind) is Jake. Most of the time he possess the “deer in the headlights” look, however this gives credence to his existence and performance. Eva Green, whom may be recognized as Artemisia from 300: Rise of an Empire, is Miss Peregrine. It is no coincidence her name is synonymous with the attributes of the peregrine falcon which she can turn into at will. Greens performance in providing stern but loving care over the children is accomplished often with just a facial expression which becomes emotionally believable. Samuel Jackson (The Legend of Tarzan) is Mr. Baron the leader of a group of monsters called the Wights. These immortals, with their enhanced physical attributes, hunt and kill peculiars. As far as Jackson’s performance, while it can be considered stereo-typical, it does show a new side to his ability of convincing fans he still has what it takes. Rounding out the cast is Ella Purnell who played the teenage Maleficent (2014). As Emma, the oldest member of the peculiars, Purnell again demonstrates her acting ability. The screenplay was written by Jane Goldman (Kingsman:The Secret Service-2104) did well in adapting this to the silver screen. Her successful association with like films in a capacity that also included that of the producer is evident. Reviews have not been favorable for this film but that, in my opinion, is due in part largely because most of them are too busy focusing on meaningless details the average movie goers either miss or don’t care about to begin with. That said, I enjoyed being taken on another one of Burton’s rides.